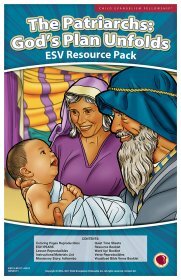 Teach children about some of the attributes of God through the dramatic stories of His servants Abraham, Isaac and Jacob. Children will learn to put their faith in God alone. This six-lesson series includes five accounts of the Patriarchs that will inspire the children to trust God in everything. 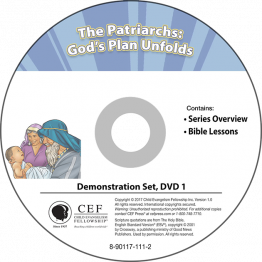 Full-color flashcard visuals to teach six lessons in the Patriarchs: God's Plan Unfold series. 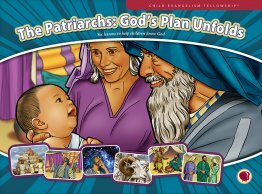 Lesson text for the six lessons in The Patriarchs: God's Plan Unfolds. 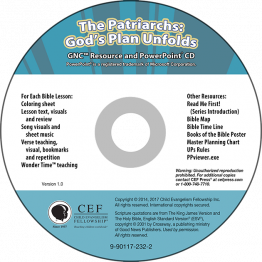 11" x 17" full-color resources: memory verse visuals, Word-Up (main truth of the lesson), resource booklet (review games and activities), UPS Rules, mission story on Martha Olango. 8 1/2" x 11" back/white lesson reproducibles: coloring sheets, memory verse bookmarks, Quiet Time sheets, skits, signs, Wonder Time. PPT visuals include flashcard visuals for Bible lesson and mission lesson on Martha Olango, CEF worker in Kenya. Words to suggested songs: Have You Heard about Jesus, Jesus Loves Me/Amazing Grace, Salvation Poem, Three Questions, and verse songs Do All to the Glory of God (1 Corinthians 10:13), He Will Do It (1 Thessalonians 5:24) To All Who Did Receive Him (John 1:12), Word-Up and other resource items. PDF’s of lesson text, verse reproducibles, Quiet Time sheets and coloring sheets. Disc 1: Overviews and complete Bible lesson demonstrations. Disc 2: Full demonstrations of all songs suggested in the series: Have You Heard? Jesus Loves Me/Amazing Grace, Salvation Poem, Three Questions, 1 Corinthians 10:31 (Do All to the Glory of God), 1 Thessalonians 5:24 (He Will Do It), John 1:12 (To All Who Did Receive Him). Spanish teacher text for Patriarchs: God's Plan Unfolds. Text includes a master planning chart, schedule, lesson overview and outline, detailed story line, review questions and more! Resource packs provide many tools to enhance and extend your teaching time. An easy-to-follow guide explains when to use each item. Everything in Spanish except the mission story. 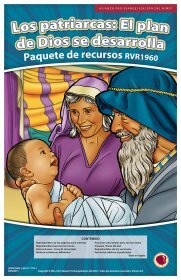 11" x 17" full-color resources: memory verse visuals, mission story on Martha Olango (with English text), Word-Up (main truth of the lesson), resource booklet (review games and activities), UPS Rules. 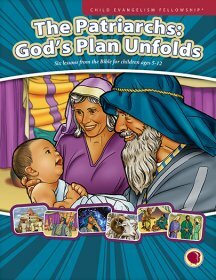 8 1/2" x 11" back/white reproducibles: coloring sheets, memory verse bookmarks and activities, skits, signs.